Input Cable set for use with the Four Channel Differential Amplifier (2 pack). A pack of ten pairs of shrouded connectors (Red & Black) for use in connecting electrodes to the GSR Amp, ADInstruments Stimulators and PowerLab 4/26T. Includes all the tubing and connectors required for combining two 4 channel Radnoti systems to make an 8 channel system. Accessories for recording wireless neural activity in freely moving rodents. The Equivital SEM USB Lead enables the connection of one Equivital SEM to a PC for charging and configuration. 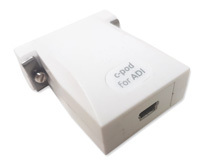 The USB cord can also be used to easily import time synchronized data files into LabChart. Used with the Intracellular Electrometer. Permits the application of large voltages to the electrode for iontophoretic injection of dyes or drugs. A 1.8 m extension cable with 3-pin audio connectors, used in connecting the Thermistor Temperature Sensors to the Thermistor Pod. Self-Contained Ussing Chamber Inserts, which include Culture Cups Inserts for adaptors (Snapwell, Millicell, Transwell) and Tissue Inserts (with O-Ring, Round with 5 Pins or Slotted with 6 pins). Connects the STH Pump Controller to the input Peristaltic Pump to maintain constant pressure. Used with the One-Way Valve Mouthpiece to prevent any air leakage when used in conjunction with the Douglas Bags. The Input Cable Set (2 mm pin, alligator clip on outboard end, BNC on inboard end), is for use with the Four Channel Differential Amplifier (2 pack). The Cedrus c-Pod allows a computer running SuperLab (and select other stimulus presentation software) to send event makers to a PowerLab data acquisition system. The Tubing Kit (Hose & Luer fittings) for use with Ussing Chambers. Electrode sets designed to be used together with any ADInstruments Bio Amp (purchased separately) for recording monophasic action potentials from isolated perfused rodent hearts in Radnoti Langendorff or Working Heart systems.